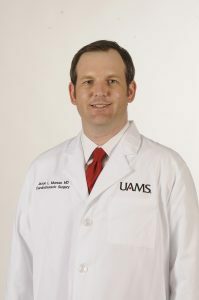 Aug. 21, 2017 | LITTLE ROCK — Fellowship-trained thoracic surgeon Jason Muesse, M.D., has joined the University of Arkansas for Medical Sciences (UAMS). He sees patients in the Surgical Oncology Clinic at the UAMS Winthrop P. Rockefeller Cancer Institute and is an assistant professor in the Department of Surgery in the UAMS College of Medicine. Muesse specializes in the surgical treatment of diseases involving the chest, including the lungs, esophagus and chest wall. Muesse’s clinical interests include lung cancer, esophageal cancer, benign esophageal diseases including achalasia and paraesophageal hernias, chest wall resection and reconstruction, hyperhidrosis, and mediastinal tumors. He has strong interest in minimally invasive surgery, including robotic surgery. Muesse, a native of College Station, Texas, obtained his undergraduate degree in biochemistry from Texas A&M University. He earned his medical degree at Texas A&M Health Science Center College of Medicine in College Station and Temple, Texas. After serving his internship and residency in general surgery at Houston Methodist Hospital, he completed fellowship training in thoracic surgery at Emory University in Atlanta. He also completed the American Association for Thoracic Surgery Graham Foundation Surgical Robotics Fellowship in 2017.